AGS – Association of Geotechnical and Geoenvironmental Specialists – Sustainability in Ground Engineering – Good Design or Good Marketing? Sustainability in Ground Engineering – Good Design or Good Marketing? Stephen Lawrence West of Ramboll, this year’s winner of the Sustainability Award at the GE Awards discusses sustainability in Ground Engineering. The concept of sustainability has become a fundamental part of our lives as engineers and scientists in the construction industry. This is a very public way in which we as a profession can serve society by helping conserve a sustainable supply of resources. Of course, the term sustainability can have a very broad definition; obviously there is the conservation of natural resources that go into the materials we use to deliver projects, there is are also a drive to reduce dependence on fuel and energy resources to process and transport materials, and we need a sustainable source of human resources to deliver the projects through planning, design, and construction. And don’t forget the desire to save one of society’s favourite resources….money! All are important and their supply needs to be used wisely or alternative resources identified and put to work. However, it is a very rare project where you can demonstrate good sustainability practice across all these indicators of sustainability. So as Geotechnical and Geo-Environmental Specialists how do we actually embed sustainability in our processes? Foundations need to be built from concrete or steel, earthworks need to be formed using earth materials, we need engineers and scientists to deliver projects, and the money must come from somewhere. So how can we deliver truly sustainable projects and recognise how we are contributing to sustainability? At Ramboll we were honoured along with our various project partners and stakeholders with the Ground Engineering Sustainability Award two years in a row. Bermondsey Dive-under railway scheme is a major urban railway interchange where the use of materials was carefully controlled to ensure full value to the client, local community, and railway users. This value was not just measured in financial terms, the use of earthworks material quantities was optimised maximising re-use of site won materials from demolition debris, foundations from the original railway structures were re-used where possible, and where not, an extensive programme of pile testing allowed significant reduction in total new pile metreage. Careful management and re-use of materials and foundation design resulted in reductions in supply mileage to this congested site which limited impact on the local community. In turn this allowed for optimum use of site space allowing rail lines to remain functional thereby reducing delays. The philosophy of sustainability was built into project processes from the tender stage and were not mere ‘add-ons’. But as indicated in the title of this article the optimal use of materials and resources was considered good design rather than a sustainable design. 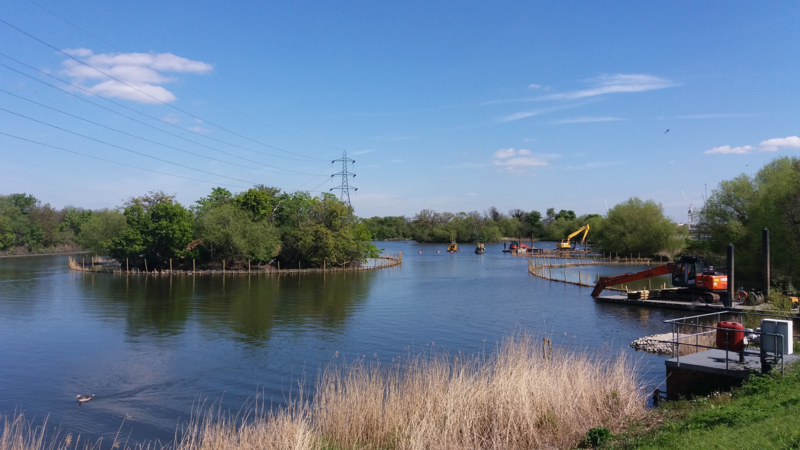 This year’s winner, the Walthamstow Wetlands, was a very different project and its success was measured by different sustainability indicators. In this case engineering skill was used to transform a valuable urban wetland resource from an underused tract of land into a location the local community can enjoy for the first time in decades. The geotechnical and hydrological elements of the project were delivered using the same consideration of high sustainability standards whilst not sacrificing good value for the local community. This was a project with a very limited resources in terms of material and money. The materials to be used for earthworks had to be won from site and the project was being financed predominantly by the Heritage Lottery fund through local government from a limited budget. The project team looked at how to re-use dredged materials to resolve engineering problems and provide ecological assets as part of this project. The reservoirs had become choked with silt since the last dredging operation, therefore this presented an opportunity to win material and aid the hydrological objectives of the projects. This material was potentially contaminated therefore disposal of excess off site was not an option as that would increase costs. A solution was developed where the material could be retained on site to form reed beds. This solution complemented the hydrological requirements of the project and in turn formed a new ecological asset for this part of London. The other major ground engineering element of the project was the design of an earth retention scheme using dredged silt. After consideration of standard engineering solutions using sheet piles, gabions, or similar, a more sustainable solution was proposed to use geotextiles supported by timber king-posts. This solution was simpler than the original concept and could be delivered without need for substantial temporary works or installation plant. This reduced construction time and delivered a finish much more in keeping with the aspirations of the overall scheme. As this scheme was for the public good there was extensive liaison with the local community and key stakeholders representing bodies such as Natural England, RSPB, anglers associations and so on. This liaison was seen as a very positive aspect of the project and the results are an estimated 185,000 visitors in six months after the site was re-opened. In both cases, good design principles have been used to deliver a scheme which measures highly on sustainability indicators. These are just two examples of excellent practice, but they are by no means isolated. Often as experienced engineers and scientists we view efficiency in design as a matter of professional pride but we should also view our good work through the lens of sustainability as well. However, to truly deliver sustainable projects on a regular basis we must embed consideration of these indicators throughout our projects. When assessing design and construction practice sustainability should be an equal consideration in the measures used to compare solutions. This will helps drive good design and then has the added bonus of generating good content for your marketing team! This approach is being seen much more on major schemes such as HS2. In order to integrate sustainability in the design process for all projects this topic is a fundamental part of the project excellence process in Ramboll, this is reflected in many other consultants and contractors. As we and many others have shown, a sustainable project often tends not to be an expensive project and actually yield community benefits beyond the provision of a new transport interchange or recreational resource. So a final thought, safety moments have become standard in meetings, what about a few sustainability moments?